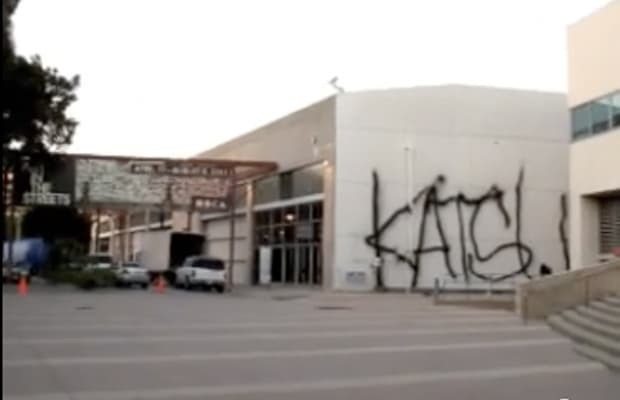 "Jeffrey Deitch wanted to have the world's largest graffiti exhibition. Sounded like a perfect opportunity to reap some fame tokens and anger the authorities. I tried weaseling my way into the show to blast an extinguisher but after being denied from every angle I decided to fly down and install my addition without permission. I linked with some BTM's in LA and scoped it out. The homie definitely pulled off the epic distraction. I had about 1 min to make it happen and I took it. I knew that they'd buff it so i had it filmed. I learned from my prior pieces that it was all about documentation and leaking it to the web. I couldn't have asked for more. Seeing KATSU on the ARTINFO.COM homepage definitely was a good thing."